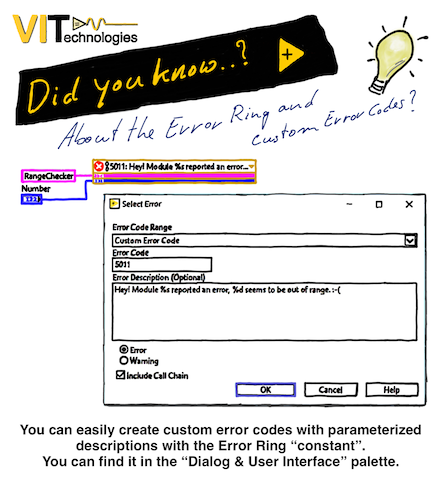 The Error Ring allows you to quickly select and pass NI or custom error codes throughout your VI. You can create a custom error message for a one-time use, and for that custom error code the Error Ring accepts parameters, similar to the format into string function. Read more about this nifty feature in NI's Online LabVIEW help. Did you know about VI Technology's #DidYouKnow campaign? If not so, find it on Facebook, Twitter and LinkedIn and make sure to follow them for even more LabVIEW tips and tricks!